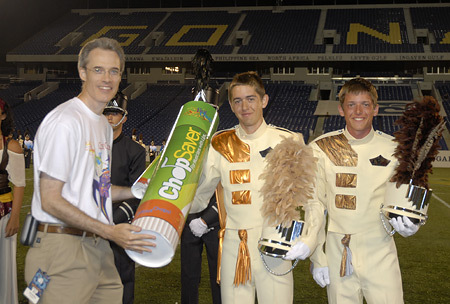 The first "Hot Chops" contest – presented by Chop Saver all-natural lip balm – of the 2007 season was a great success at Drum Corps International's kickoff show in Annapolis, Md. Hundreds of fans participated in this new contest as they flipped open their cell phones to text and vote for their favorite brass line of the night. This great opportunity for fans let them voice their opinions on which corps' brass section they enjoyed the most, and allowed them to interact with each other and their favorite corps in a completely new way. ChopSaver creator Dan Gossling presents Carolina Crown with the "Hot Chops" traveling trophy. "It was really cool to vote for your favorites corps; I felt like my opinion actually mattered," said Alex Whisnant, a student from North Carolina. "I would definitely want to do this again." Allison Rodriguez, another student in attendance, said: "I loved it! It made me want to jump up and down and scream when the corps I voted for won." Once voting polls opened at the conclusion of the last corps' performance, fans had 15 minutes to text their votes until polls closed. The first winner of tonight's "Hot Chops" contest, awarding the fan's favorite "Hot Chops" brass line, was Carolina Crown. Drum Major Evan VanDoren accepted the award on behalf of the corps, and was very proud to receive this gift from the fans. "Receiving tonight's 'Hot Chops' award for favorite brass section is certainly a huge honor and we really appreciate the support we receive from our fans. One of the main reasons we are all involved in this activity is to entertain the crowd," said VanDoren. "It's a pleasure to know that they appreciate us, and we'll continue to work hard to please them." If you missed tonight's competition, you can participate in the other "Hot Chops" contests held at Westminster, Md. on June 29; East Rutherford, N.J. on June 30; Beverly, N.J. on July 4 and Lawrence, Mass. on July 6.